Chai (חי) is a Hebrew word and symbol that means “life,” "alive," or "living." It is spelled with the Hebrew letters Chet (ח) and Yud (י). Jews often wear a Chai on a necklace in the form of a medallion or amulet, sometimes along with a Hamsa, another symbol of eye embedded in the palm of an open hand, or the most prominent symbol of the Jewish faith, the Star of David. Rings and bracelets with the symbol are also popular. Chai is usually pronounced with a "kh" sound and recalls the guttural German pronunciation of "Bach." Judaism, like a number of religions, emphasizes the importance of life. Jews are encouraged to be good, ethical people, or mensches, exhibiting such traits as kindness, thoughtfulness, and selflessness and remaining good-natured, enjoying the time that they are given on Earth. A common Jewish toast is “L’chaim!” which means “To life!” It is said at weddings, bar mitzvahs, bat mitzvahs, Yom Kippur, Rosh Hashana, Friday Shabbat services, and other Jewish celebrations in anticipation of all the good things that are to come. 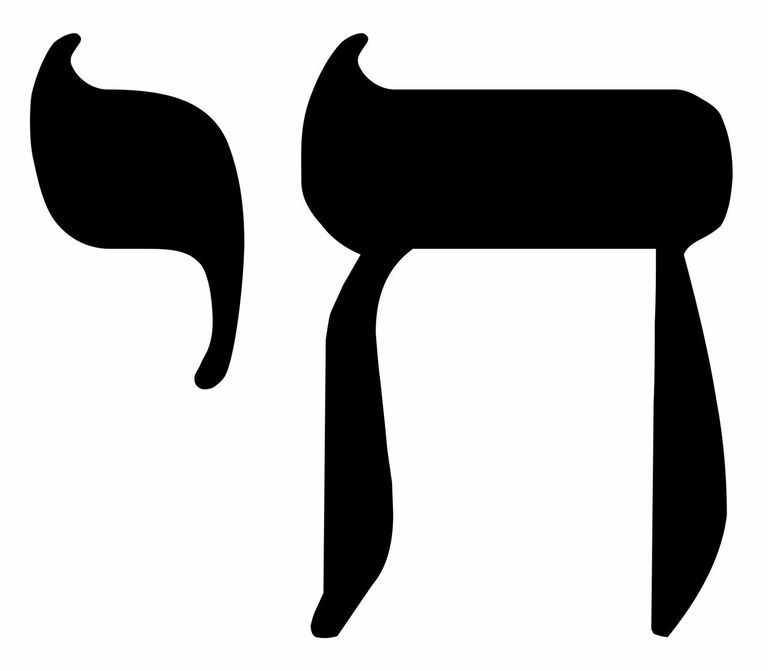 For Jews, chaim (the plural form of the word) symbolizes the value of life and the hope that supports it. It also represents the will to live and serves as a reminder to the Jews to live and protect life. Like other Jewish symbols, the Chai symbol is a popular image with many applications, including sculptures, paintings, plaques, and tapestries. According to the gematria, a mystical Jewish tradition that assigns a numerological value to Hebrew letters, the letters chet (ח) and yud (י) add up to the number 18. The chet has a value of 8 and the yud has a value of 10. As a result, 18 is a popular number that represents good luck. At weddings, bar mitzvahs, and other events, Jews often give gifts of money in multiples of 18, symbolically giving the recipient the gift of life or luck. This manner of giving gifts is referred to as "giving Chai." This nomenclature extends to multiples, as the number 36 is commonly referred to as "double chai." The popular Jewish phrase “Am Yisrael Chai” also appears at less solemn occasions. It is used as a prayer of sorts, or declaration for the long-term survival of Israel and the Jewish people, who have been threatened with annihilation many times over the centuries, most notably during the Holocaust. According to the Jewish newspaper The Forward, Chai as a symbol goes back to medieval Spain, and its use as an amulet originated in 18th century Eastern Europe. Letters were used as symbols in Jewish culture as far back as the earliest Jewish roots. In fact, the Talmud states that the world was created from Hebrew letters that form verses of the Torah. Chai is linked to texts of the Kabbalah, a Jewish mystical movement that began in the 12th century. The term also appears at least three times in the Bible, including in Leviticus and Deuteronomy. Although jewelry is the most popular way of displaying the Chai symbol, it is not the only way. Among the many items adorned with the Chai are modern items such as mugs and T-shirts, as well as traditional Jewish items like the tallits (prayer shawls) and mezuzahs (a religious object that consists of a decorative case protecting a piece of parchment). Paintings, tapestries, and other artwork also sometimes feature the Chai symbol.